This hair butter comes in a white plastic jar of 200 g capacity. It is decorated with yellow bronze label. Women who value elegance and exclusive cosmetic might not be thrilled with the packaging, however, eco fans would be very pleased. Najel butter does not contain only coconut oil (as the name of the product suggests). It also comprises olive oil, karite butter (also known as shea butter) and argan oil. Shea butter is mainly recommended for the care of low porosity because, in majority, its components are saturated fatty acids (especially oleic acid which appears in 50 % concentration). It is a light and well absorbed butter with a pleasant scent. Additionally, it provides wisps with beautiful shine and nourishes them, protecting against damaging effects of weather conditions. Furthermore, the good news is that women with medium porosity hair can also reach for shea butter: fatty acids contaned in it will be suitable for such hair type. Coconut oil (which naturally occurs in solid, butter-like form) is another substance recommended for low porosity hair care. Coconut oil coats strands with a protective film that does not only protect them against damages and harmful weather condition but also from mechanical damages. Moreover, coconut oil is as easily absorbed as shea butter, it does not weigh strands down. What is more, this microscopic coating prevents toxins from penetrating inside. Najel hair butter also consist of olive oil. This natural component comprise only 15 % of saturated fatty acids (this fact may disqualify it as a product suitable for thick, strong hair). Oleic acid appears in majority (75%). Therefore, olive oil is recommended for medium porosity hair care, while low porosity strands can be lightly overburdened. Another oil present in this butter is argan oil. Due to the content of omega-9 fatty acids (49% of oleic acid) and omega-6 (36% linoleic acid), it is perfect for medium and high porosity strands. Unfortunately, low porosity wisps will not be fond of it, although it has protecting and nourishing properties. According to the producer, this butter is designed for body and hair care (especially over-dried, brittling and damaged wisps). Thanks to argan oil and olive oil, the butter is really able to care for damaged strands, however, the presence of coconut oil and shea butter disqualifies it as a product for high porosity hair. In this care it will be a great treatment for medium porosity. Owners of thick and healthy hair can only apply it to their body, avoiding hair and scalp. 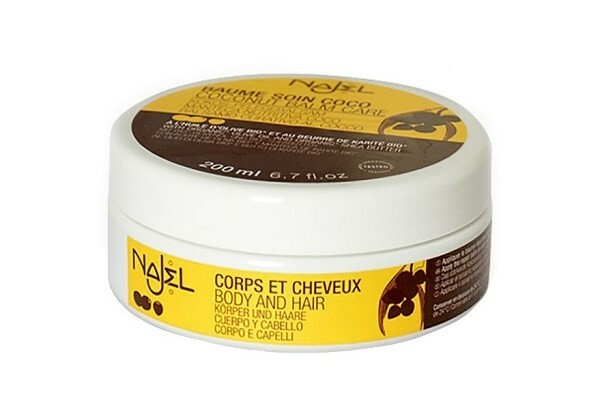 Najel hair and body butter ought to be applied to damp skin (preferably after a bath). If your hair has medium porosity and you want to try out the power of Najel – use it as a hair mask that requires washing off. Of course, applying it to dry hair without rinsing is also possible, however, the selection of oils and butters is rather controversial – it can overburden strands or cause frizz. The option that depends on washing the product off with a gentle shampoo seems to be a bit safer. Najel butter is a product recommended for body care rather than hair care. The selection of ingredients and variety of fatty acids make it hard to predict how the product will work on specific hair types. If your hair is of low porosity, oils can weigh your wisps down, however, it can cause frizz or oily scalp of low and medium porosity. Nevertheless, Najel butter is a great product for skin care.